3x JUNO nominees and Billboard charting Sultans of String are an “energetic and exciting band with talent to burn!” (Maverick Magazine UK). Thrilling audiences with their genre-hopping passport of Celtic reels, Gypsy-jazz, Arabic and Cuban rhythms, fiery violin dances with kinetic guitar, while bass and percussion lay down unstoppable grooves. Throughout, acoustic strings meet electronic wizardry to create layers and depth of sound. Celebrating a milestone 10 years together, Sultans of String have hit #1 across Canada on Top 10 national radio charts, the New York Times Christmas Hits list, and received multiple awards and accolades, including 1st place in the ISC (out of 15,000 entries), 3 Canadian Folk Music Awards, plus invitations to perform/record with such luminaries as The Chieftains, Sweet Honey in the Rock, Richard Bona (Paul Simon), and Ruben Blades. Bandleader/violinist Chris McKhool (Jesse Cook, Pavlo), a Queen’s Diamond Jubilee medal recipient, was raised in a Lebanese-Egyptian household just bursting with music and diversity. Growing up, he was fed a steady diet of delicious musicality alongside Middle Eastern cuisine and violin lessons. When he first heard founding guitarist Kevin Laliberté’s (Jesse Cook) rumba rhythm, their musical synergy created Sultans of String’s signature sound – the intimate and playful relationship between violin and guitar. From this rich foundation, the dynamic duo grew, featuring such amazing musical friends as in-the-pocket bass master Drew Birston (Chantal Kreviazuk) and jaw-dropping percussionist Chendy Leon. 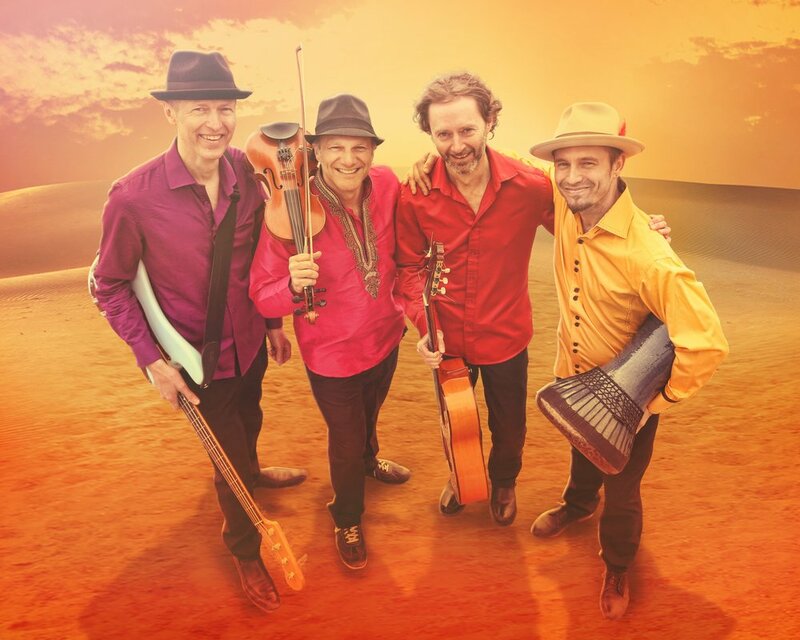 Sultans of String have been criss-crossing North America and UK for the last several years at many taste-making forums such as JUNOfest, NYC’s legendary Birdland, Boston’s Scullers and London’s Trafalgar Square. They recently sold out Koerner Hall (Toronto’s Carnegie Hall), and performed with Toronto, Vancouver, Edmonton, Stratford, Ontario and Niagara Symphony Orchestras, as well with Kingsfield POPS in Maine and Maryland’s Annapolis Symphony. Sultans of String were filmed by MPBN’s Maine Arts! in a feature concert, and have performed live on BBC TV, BBC Radio, Irish National Radio, and the internationally syndicated shows WoodSongs, World Cafe, and on SiriusXM in Washington.